Taco Bell sold its one billionth Doritos Locos Taco this week. Congrats, America: collectively, you have devoured one billion Doritos Locos Tacos as of this week. That’s enough for everyone in the U.S. to have three DTLs. If this isn’t something to pat yourself on the back for, we don’t know what is. 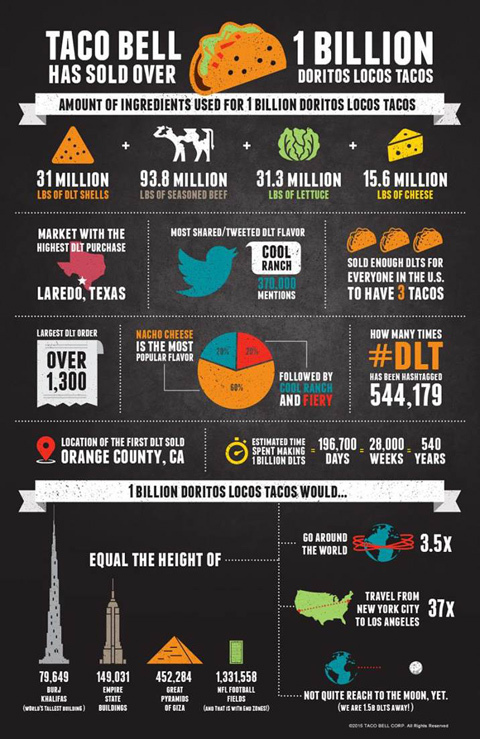 In honor of this important milestone, Taco Bell takes a look at some fun facts about DLTs in one colorful infographic. And, if you were wondering, 1,000,000,000 Doritos Locos Tacos would stretch the length of 1,331,558 NFL football fields. And #DLT has been hashtagged 544,179 times, which is all kinds of ridiculous and amazing at the same time. Possibly the most important fact: although Nacho Cheese is the most popular DTL flavor, the most Tweeted-about flavor is Cool Ranch. Fascinating.